The launch of the IRISS Flex-IR® Infrared Window and ultrasound/partial discharge inspection product lines for unique applications ensures that the Infrared Window is exactly what is needed. The toughest and smartest IR Window Solutions in the world now offer unparalleled design flexibility and speed of installation. The Toughest & Smartest IR Window System in the world now offers the customer design flexibility and speed of installation beyond compare. The patented IRISS polymer systems allow IRISS to build infrared window and ultrasound/Partial Discharge inspection systems to meet the exact needs of the client. IRISS is now the only global infrared window manufacturer with custom built solutions. IRISS understands that not every application is suitable for a standard inspection window. The FlexIR custom product lines can be manufactured in an infinite number of shapes and sizes, thus minimizing the number of inspection windows needed and the time required to install the units. The FlexIR panel replacement programs are the fastest inspection window system available in the world today. 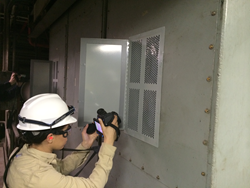 FlexIR solutions enable clients to precisely detail the size and type of inspection window required and the panel size and design of their electrical distribution equipment. Once the IRISS design engineers have this information IRISS takes care of the rest. Installation is quick and simple. The client only needs to swap-out the old panel with the new FlexIR panel thus alleviating the need to cut the existing panel, prepare and treat the metal surfaces and install the new window. This process only takes minutes and provides a huge cost savings on man hours and the number of window required. The IRISS FlexIR systems allow clients safe access to energized targets previously considered impossible. Direct temperature measurement is now available on those unique applications without the increased risk associated with removing covers or guards. The IRISS UL508 state-of-the-art manufacturing facility features a complete vertically integrated production system including metal fabrication, bending, welding, paint & label making. IRISS utilizes quick prototyping via 3D scanning, modeling & 3D printing techniques which enhances our ability to create custom solutions in record time. Clients that do not have access to panel drawings, etc. utilize the IRISS on-site 3D scanning technicians who scan and measure all the equipment requiring modification to provide 3D models for the clients approval before the manufacture of their final FlexIR units. IRISS is a leader in the design and manufacturing of Electrical Maintenance Safety Devices (EMSD) and known for their innovative patented Infrared Window and Ultrasound/Partial Discharge inspection solutions that allow Condition Based inspections of energized electrical equipment while the panels remain in a closed and guarded condition.